Budgeting is essential to ensuring a healthy financial future. In fact, most people believe budgeting is one of the most important habits to have. However, only 41% of people actually create and follow a monthly budget. That number could continue to shrink as more children grow up without the knowledge or guidance needed to create a monthly budget. The result could be more people taking on debt and stress as they enter adulthood. Not only does a budget ensure that you have enough money for groceries each month, it also helps you plan for the future. For example, budgeting savings and investments is a huge part of retirement planning. So, how do you get your kids on board with budgeting? There are some kid-specific strategies to help you accomplish this goal. They say the best way to learn is by doing. If you sit down to work on a household budget every month then you should take the time to include your children as well. This is especially important as your children enter their teenage years and get closer to becoming adults themselves. Make time for some family meetings to involve the household budget. Of course, what you say about the family situation may depend on your child’s age. Older children will be able to grasp and understand some concepts while younger children may need to have things simplified. The important part of the exercise is that you are involving them. If possible, have your children help make some decisions. Not only will they get to practice budgeting but they will also feel ownership over the budget because they have helped create it. They can actually see how some decisions may affect the rest of the family budget and be more conscious of their own habits. People who start saving at a younger age can retire with much more money than those that begin saving later in life – even if the late savers set aside money for a longer period of time overall. Teaching about how to budget for savings could set your child up for a successful retirement before they have even gone to college or started their career. If you have been maintaining a savings budget for some time then you may be proud of what you have achieved. Share that pride with your children and explain to them what this will allow for you in retirement. Kids often want to know the “why” just as much as the “how.” Sharing your saving strategy and success with them is not bragging; it is education. When you feel that your child is ready for a bank account then you may want to consider opening one for them. Understanding banking is an essential part of budgeting. Dedicate a family meeting to discussing the importance of banking, how to use a bank account, and how to avoid some common mistakes. Most banks will set up free accounts for children and teenagers. If possible, you may want to have them open their own savings account which can be used as part of their college planning. 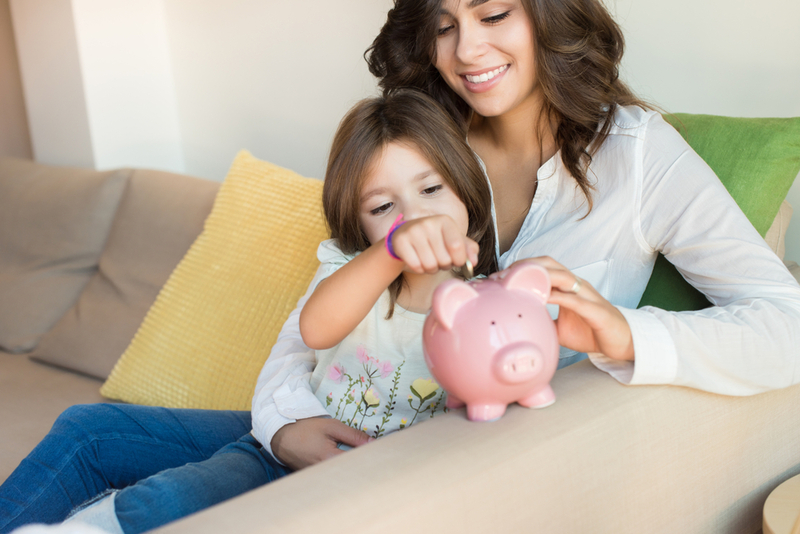 How your children put money into the bank is up to you. Some older kids may look for part-time work while younger children may earn money through chores. Having a budget or savings plan dictated to you is not very exciting and does not inspire very much passion for finances. Instead of telling your kids what their budget should include and what they should be saving for, ask them what they are saving for. A lot of kids will have consumer items in their savings wish list. In fact, these lists might not vary much from the type of list you see around the holidays. Video game consoles, smartphones, and concert tickets will be common items to find. While you may not agree with saving for a video game console, the act of saving and avoiding instant gratification should be rewarded as it helps build good behavior for the future. Let’s face it – saving is not easy nor is it very fun. Allow your children to set goals and reward themselves for reaching those saving goals. If you want, you may even begin tracking progress in family meetings to help build accountability and excitement when a goal is reached. Later in life, this lesson will come in handy as your children begin saving for homes, retirement, or even their own child’s college fund. Whether you are looking at buying a new television for the living room or thinking of upgrading to a larger home – include your children in the decision making process. Allowing them to watch as you work through your finances to find a solution helps them build problem solving skills. This is also a fantastic opportunity to teach your children about purchase research. Do you simply go out and buy the nicest item your money can afford or do you research products, look for sales, and read reviews to ensure that your money goes as far as it can? If some of those discussions above seemed like they could be difficult or awkward then don’t worry – you are not alone in that feeling. Family meetings can be difficult. Family meetings about finances can be downright scary or exhausting for those who are not experienced or prepared. In addition to managing your entire financial picture, at Mooney Lyons, we help guide you through important family meetings. Communication is key when it comes to family finances and we’re here to help you get the conversation started. Whether you are building a plan with your pre-teen about saving for their first smartphone or working on college planning with your teen; contact us at Mooney Lyons today for family meeting guidance.